Veterans Peace of Mind is offering a program to veterans combining Mindfulness Meditation with Equine-Assisted Therapy for Veterans and Active Duty Service Members at Twin Oaks Farm in Longmont, CO. We meet every other Wednesday from 12:00 Noon to 2:00 PM. Our own mind is our own worst enemy. We try to focus, and our mind wanders off. We try to keep stress at bay, but anxiety keeps us awake at night. Training our mind through peaceful abiding mindfulness, we can create an alliance that allows us to actually use our mind, rather than be used by it. Many scientific studies at this point have verified the value of mindfulness for stress-reduction, emotional well-being, improved health, and other benefits. Veterans’ Peace of Mind uses a variety of mindfulness-based techniques to “dis-empower” the triggers of trauma, exercising choice as to whether or not they allow the triggers to escalate and run away with them. Learning to let go of afflictive emotions and obsessive thinking in this way relaxes stress and invites a healthier, more joyful experience of life. When the mind isn’t cluttered with a lot of thoughts, its true nature is cheerful. 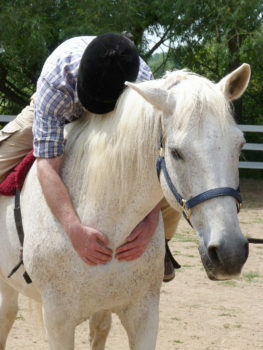 Horses facilitate mindfulness naturally.